On March 2nd, kids from across the nation celebrate Dr. Seuss's birthday by participating in NEA's Read Across America Day events, a huge reading celebration. 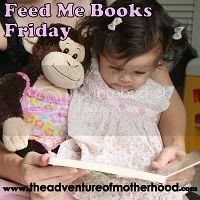 This week's Feed Me Books Friday theme at The Adventure of Motherhood is "Books by Dr. Seuss in honor of his upcoming birthday". Link up your favorites there. Surprisingly, I don't really recall liking too many Dr. Seuss books as a child. 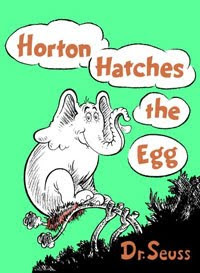 One of his books that I do remember reading with my mom often is Horton Hatches the Egg. I'm not sure where my mom bought our copy, but she probably found it at a garage sale or maybe she got it for free from the store. If I remember correctly, the paperback copy we owned had a mark on the cover indicating that it was part of a promotion for Crest/Prell/Wondra. Our copy suffered some wear from the frequent readings. I'm not sure if my mom still has our copy, but if it was still in good condition it looks like it would be worth more than many of the normal editions because of it's rarity. Who would guess a once free book would have any worth? Go figure. Horton Hatches the Egg is one of Dr. Seuss's earlier works, first published in 1940. In the book, Horton agrees to sit on a Mazie's (a lazy bird) egg while she goes off on a "short" vacation. He faithfully sits on the egg through the rain and snow and kept on, even though the other animals teased him and people made him part of a circus act. "I meant what I said / And I said what I meant.... / An elephant's faithful / One hundred per cent!" Horton is an extremely lovable character. Readers can easily sympathize with him. The witty, rhyming verses in this book are top notch, showing Seuss's genius way with words. The book does contain an image of hunters with guns, so sensitive children may get a little frightened at this part. Several moral themes run through the book including responsibility, perseverance and keeping your word. In an Anchorage Daily News article from 1978, Seuss says that the idea for Horton came while he was working in his studio one day and the wind blew a picture of an elephant on top of another piece of paper where he had drawn a tree. In that same article he remarks, "Teaching a child to read is a family setup. It's the business of having books around the house, not forcing them. Parents should have 20 books stacked on tables or set around the living room. The average kid will pick one up, find something interesting. And pretty soon he's reading." Horton Hatches the Egg is on top of one of our piles right now! 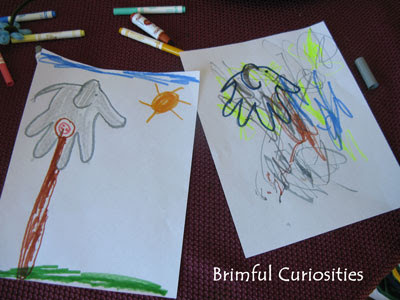 We made Horton Handprint Elephants for a corresponding craft. I saw the idea for the handprint elephants on the Learning 4 Fun blog and we added a tree, nest and egg to complete Horton inspired pictures. They turned out pretty cute. Thanks for the links to corresponding activities! I love discovering new books and ways to "make them stick" for my daughter. Great minds think alike - this was my choice for today's "Feed Me Books Friday" too! Your related activities are awesome...I am going to add a comment to our post sending readers over here to see them. Have a great weekend! I had actually never read Horton Hears a Who until I was in college! Yea, I don't think my mom was a big fan of Dr Seuss :) I love the line you quoted. And I adore that craft. Just fantastic! And such a great way to bring the book to life for little ones. Thanks for sharing. Wow a handprint does look like an elephant! I love how you added the info on Dr. Suess's interview. That was really interesting. You may want to check the analysis of Horton Hatches the Egg in the new book, Hidden Messages in Children's Picture Books. While I'm sure it is not what Seuss intended, the story does not reflect all that well on either women or men who choose to engage in childcare. Note the absence of women on the page where it says the "people" all cheered. Apparently women don't count as people.